Hi all… I’m starting my new year’s entry on a sad note. The reason why I haven’t posted since Thanksgiving is that, less than a week later, I experienced the loss of my father, Bryan Humphrey, after a bout with invasive sqaemous cell carcinoma. To those of us who loved him, the loss occurred very quickly, but for him, each day was painful and torturous, so though I am very sad, I am glad he is relieved of his suffering. Suffer, he did. A lot. And so my knitting has suffered as well. Not that my father would have wanted me to stop knitting. But during the last weeks and months of his life, I made several long trips in the car to visit with him, and always had my knitting with me. I knitted, too, by his bedside as we talked, or while he slept, or while he listened to me yammer on about my kids, my job, just about anything. But at the moment, since his passing, I am finding it hard to knit. I hope to be back among the bloggers with news of my projects again soon, but until then, thanks, as always, for your love and support. 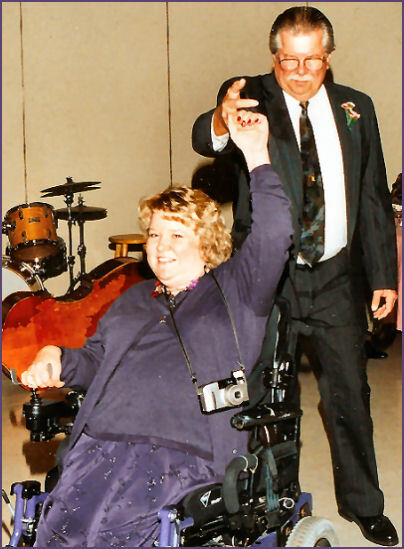 This photo is of Dad and I dancing at my brother Michael’s wedding in October of 2000. This was a good day. I love you, Dad, and may you be at peace.